Don't worry about dark energy. Worry about disapproving energy! PS: Follow Bun on FB!! ALSO: Say hi to Speedy ;-), it's Wednesday, Speedy seriously disapproves on Wednesdays. 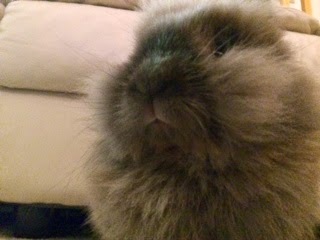 BUN is on FB with his own page- testing toys, teaching Binky-behavior and disapproving! It is Wednesday. Far too late to be worrying. Time to be getting our things together ... The DARKNESS approaches. Wow! Absolutely bristling with epic disapproval! We'd best all scuttle off to do our bun chores asap. Hop to it. Now HUMAN. "Once on a high and windy hill, in the morning mist one bunn was p****d, and the world stood still." JUST BEAUTIFUL. Making my human share this on my page...www.facebook.com/fuzzywabbit. I'd like to smooch that adorable nosie, and that fluffeh forehead. I'm not sure I'd be allowed to survive the experience, however. But, Fleetie, isn't the real question,"Would it be worth it anyway?" Of course, we have all already willed our worldly goods to bunny rescue organizations. So now we can all live according to the injunction engraved on a lovely small wooden box I saw a while back at a local gallery. It was something like, "Life isn't about weathering storms. It is about making sure you have danced in the rain." I guess talk of wooden boxes is a little disturbing, but here in Texas we also have country western music that is often encouraging. "And if you have the choice of sitting this one out, I hope you dance." Some of us can never quite get the lyrics right, but what it all amounts to is - Smooch! And make it snappeh! Jane, My human has much the same philosophy. She has the scars to prove it. Do you feel lucky? Come visit me!